A Year of Being Here: Miller Williams: "Compassion"
"Compassion" by Miller Williams, from The Ways We Touch: Poems. © University of Illinois Press, 1997. 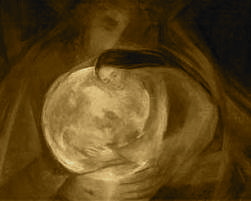 Image credit: "Compassion," painting by Mary Southard (originally color).